Motor Insurance - Choose the one that’s right for you. You can now enjoy the roads without worries with our First Class Motor Insurance that’s ready to protect you under any circumstances. Whether it’s life, responsibility towards the third party and the insured, including theft and fire, you can be sure we can keep you protected. We have many professional auto repair shops within our network nationwide that are more equipped with the best technologies. The TVI Smart Solution allows us to track where the accident happens as it happens, making our service fast and impeccable. What type of car is best suited for this type of insurance? Best suited for those that look for an all-around coverage. For drivers who have just purchased a new car or new drivers that are more at risk with accidents, this plan provides the highest confidence and the best protection for all the unexpected incidents that might occur. This plan is also highly suitable for cars that do the heavy lifting on a daily basis. In what cases does this plan cover? Highest protection in all cases, this includes protection from collisions and other damages such as fire, loss of vehicle, medical expenses resulted from an accident, even the cost for bail. In the case that the insured is being prosecuted, please study the table below. 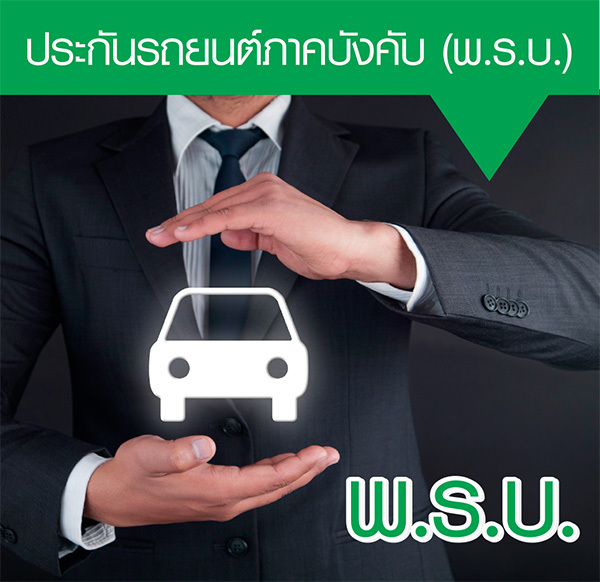 Second Class Motor Insurance. Heavy on coverage, light on the wallet. You can always feel confident that we offer the best coverage with the cost of service that doesn’t break the bank. This special Second Class Insurance guarantees to offer the coverage that can’t be beaten, whether it’s loss of the vehicle, fire or even a collision, we’ve got you covered along with many other special privileges with the best service. 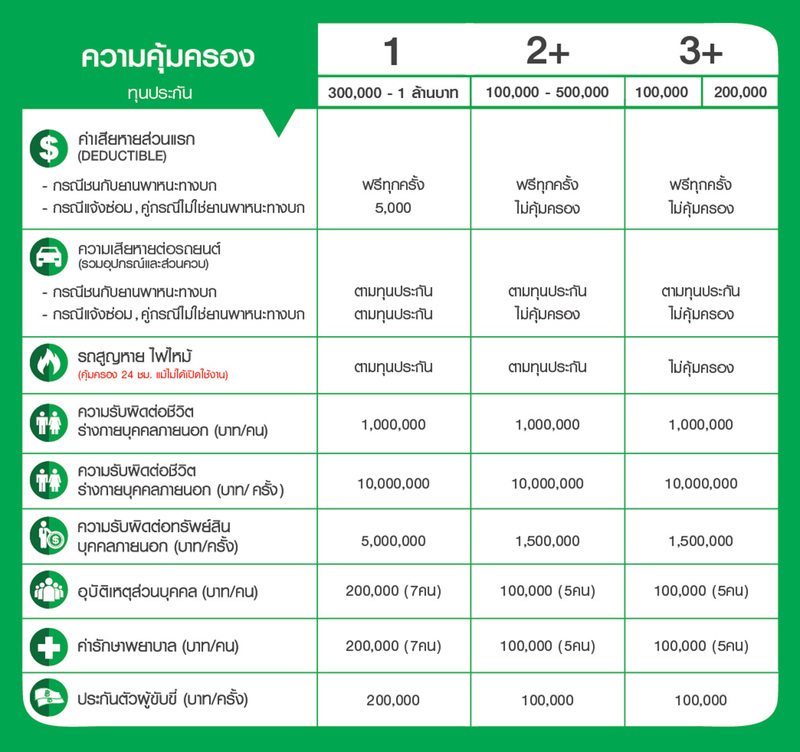 All that and you can still rest easy at the starting service price of just 7,300 THB per year. This plan is best suited for drivers who are experienced and are confident on the road but still want a plan that’s similar to First Class in case there’s a loss of vehicle, a fire, or responsibility towards a third party. This also includes repairs in the case of a collision with another land vehicle. The coverage for this plan goes across many cases such as loss of vehicle, fire, a collision with a third party or an act of terrorism. We also include coverage in medical expenses when you get into an accident and need in-patient care from a hospital, costs of travel when your vehicle is in repair and extra help provided for your family and loved ones when an unexpected incident happens. Please find more information from the table below. Special Privileges just for you. Repairs can be done in any of more than 1,000 auto repair shops full of experts in our network. Free 24-Hour emergency assistance nationwide. Service that provide you with transportation when you choose to put your vehicle in repair. Third Class Motor Insurance. Heavy on coverage, light on the wallet. This special Third Class Motor Insurance plan provides coverage not just for you but also for your family, making sure you can go on the road without worries. 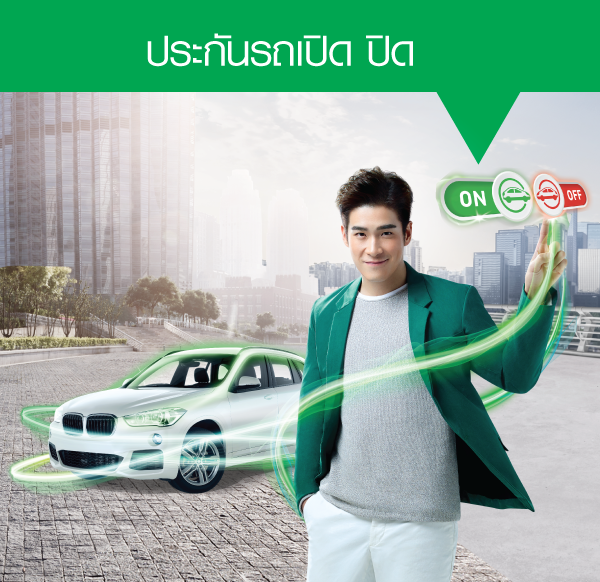 With cost of service starting at just 6,300 THB a year, it’s the coverage that can give you a whole lot more. This type is best suited for the car you love, but it should have been with you for a period of time because it’s less at risk of loss than a brand new vehicle. This plan is best suited for vehicles that have low risk of theft and fire, the most basic care you can give to the car you cherish. This type of insurance still provides you with the coverage that goes across many areas such as your life, third party’s property, damages from a collision when the third party is a land vehicle and protects your car from terrorism. We also include help when you are admitted as an in-patient in a hospital due to an accident, help for your family and costs of travel for when your vehicle is in repair. Please find out more from the table below. 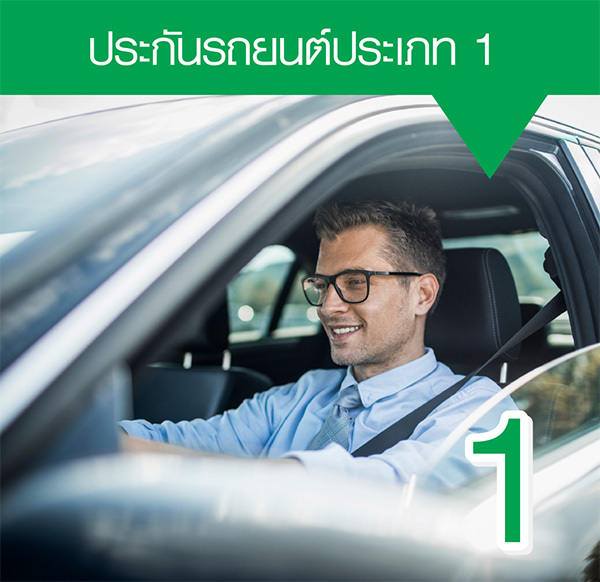 For the first time, Pay-Per-Use motor insurance is a new kind of motor insurance which offer control over your insurance expenses by allowing on and off coverage through your smartphone application. No drive, No pay. Freely choose your coverage. 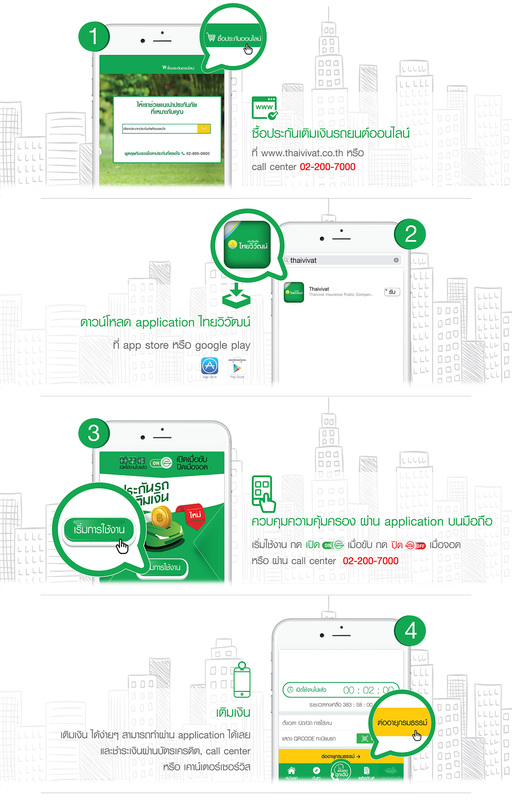 Premium starts from 600 baht. 4 packages available.